Activists around the world joined the Gitmo Global Day of Action, demanding the prison be closed and an end to the indefinite detention of its inmates. They say President Obama has not fulfilled his promises as hunger strikes and force-feeding continue. The campaign, coordinated by the Witness Against Torture group, along with other human rights organizations, are banding together for a Global Day of Action to Close Guantanamo and End Indefinite Detention. The major demonstration took place at Lafayette Square in front of the White House in Washington, DC. Additional rallies took place in other US cities, including Chicago, New York and San Francisco. London (UK), Mexico City (Mexico), Munich (Germany), Sydney (Australia) and Toronto (Canada) are also joining the campaign. The protesters made speeches and wore orange jumpsuits representing detainees as part of photogenic demonstrations, according to a statement by Amnesty International, another organizer of the action. The participants of the rally were also urged to sign a petition and tweet at Barack Obama and @WhiteHouse. On May 23, 2013, Obama again promised to close the detention facility but the situation in notorious prison hasn’t improved so far. Now a year later human rights groups decided to remind the US president of his broken promise. 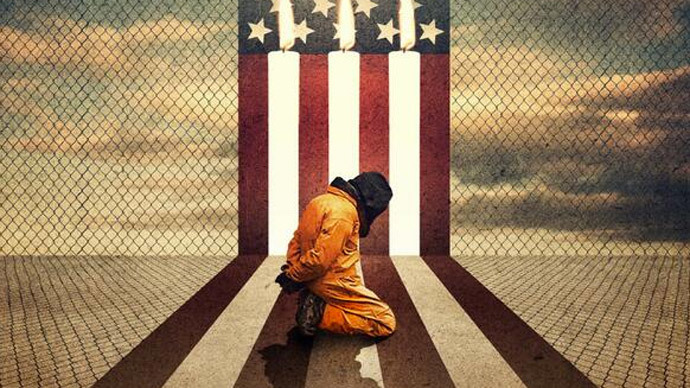 “Guantanamo continues to be an example of how the United States has forfeited the most basic human rights. We now stand as a country that tortures and detains prisoners indefinitely,” says the group on its website. Obama has repeatedly promised to shut down the notorious prison. The first ‘vow’ was made during his first presidential campaign back in 2007. In 2009, the freshly-inaugurated President Obama signed an executive order to close the detention facility within one year. However, the prison remained operational. He claimed the vow meant to "restore the standards of due process and the core constitutional values that have made this country great even in the midst of war, even in dealing with terrorism." Two years later in 2011, he signed another executive order, focused on creating a review process for detainees aiming to "establish, as a discretionary matter, a process to review on a periodic basis the executive branch's continued, discretionary exercise of existing detention authority in individual cases." The hunger strike began in February 2013 as a protest by the prisoners against their indefinite detention. 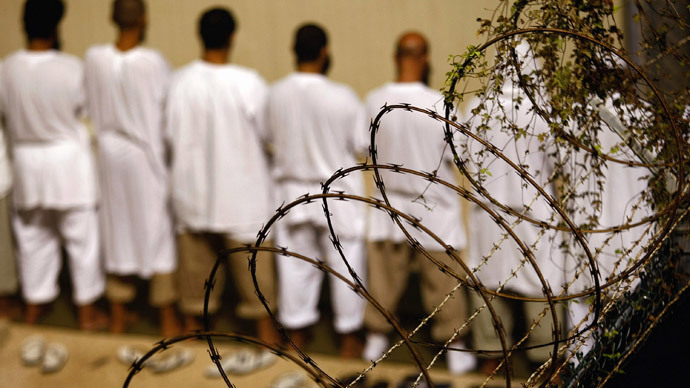 More than two-thirds of Guantanamo’s inmates refused food when the strike reached its peak. In order to deal with the situation, the US used to force-feeding techniques, and despite the process being labeled as “torture” by the UN Human Rights Commission. “Guantanamo is still open. Prisoners are being force fed every day. They are being held in conditions of solitary confinement and there is no word and when 77 of them, still in the prison who have been cleared for release for years, will ever get to live,” Debra Sweet, director of the World Can't Wait, a US group dedicated to mobilizing mass resistance to crimes committed by the US government, told RT. “A policy of the US fighting to have a place where they can do whatever they want to do to people is still intact and this is what we are protesting along with a clear policy of indefinite detention which president Obama in particular has embraced,” she added. 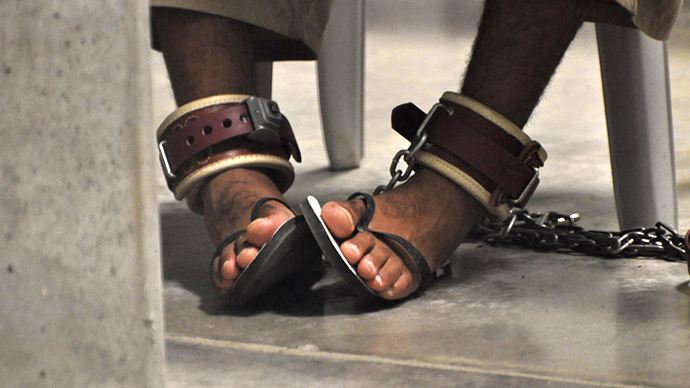 According to the lawyer for one Guantanamo detainee, David H. Remes, those who are detained in the prison are desperate. “I think that the issue is not should you house the detainees in better housing but should you transfer them or deal with them in a bad way from the standpoint of the system of justice. It really doesn’t matter how you are indefinitely detained. What matters is being indefinitely detained,” he added. 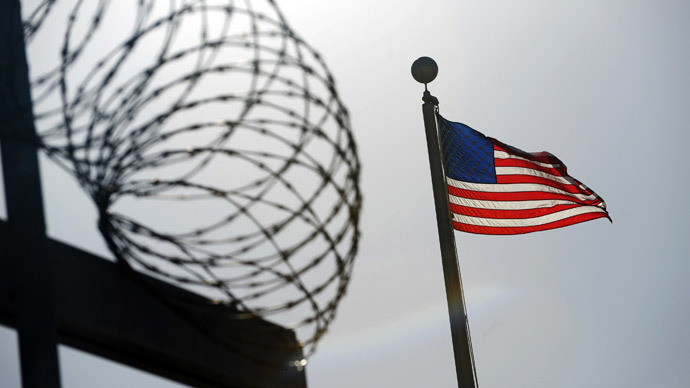 In May for the first time since the opening of the notorious camp, US federal court ordered the US administration to supply secret recordings showing the force-feeding of a Syrian hunger-striker, Abu Wa’el Dhiab, 42, who was detained in the prison. Although the videos will not be made available to the public, it will give non-government officials a first-hand look at the practice of force-feeding. In July, 2013, a US rapper Yasiin Bey, otherwise known as Mos Def, provided some insight as to how painful the procedure can be when he volunteered to sit for a feeding in a publicly released video. Guantanamo, a detention facility in Cuba cloaked in secrecy since its opening in 2002, was built to hold captives in the Global War on Terror, which the US initiated after the 9/11 attacks. It still holds 154 men out of an estimated 800 individuals – many of them innocent of any crime – who passed through Gitmo’s gates in the course of the ‘War on Terror’.